Sultan Petr el Bouchi finally had had enough. Having been in the oil business all his life, he had no reason to fear the economic crisis. Even as he spoke his fortune grew bigger by the day. A brand new bank had recently been formed because the huge amounts on his accounts couldn’t possibly be managed by the existing ones alone. But he was bothered by the Somali pirates. They kept attacking his dhow fleet, which was another one of the country’s sources of income. The boats transported bulk loads of camel droppings to agricultural projects throughout the land. To please the tourists, an annual race was held to see which boat could deliver its cargo in record time. Paying passengers were invited on board on the way back, all proceeds being donated to the capital zoo which was patroned by the sultan himself. ShipShape shipyard buzzed with action. “Is that dishy sheik coming yet?” was the talk among the excited, overdressed secretaries as they ran around the main assembly hall, the nervous click of their high heels resounding through its overwhelming emptiness: the company was in desperate need of shipbuilding orders now imminent. A temporary stage was constructed to welcome the sultan in style and make him feel at home. “Test, test,” a sound engineer mumbled into his microphone while his companion at the sound mixing table blinked at a belly dancer who looked just a little too European. She blushed, covering her face in a veil as she tried to perform another hip swaying pirouette. Suddenly, the Arabic background muzak was rudely torn by a terribly false police alarm crescendo. Another wave of excitement rushed through the hall: there he was, at last! Ron de Vos invited the two ladies into his office which was dominated by a large-scale ship model. 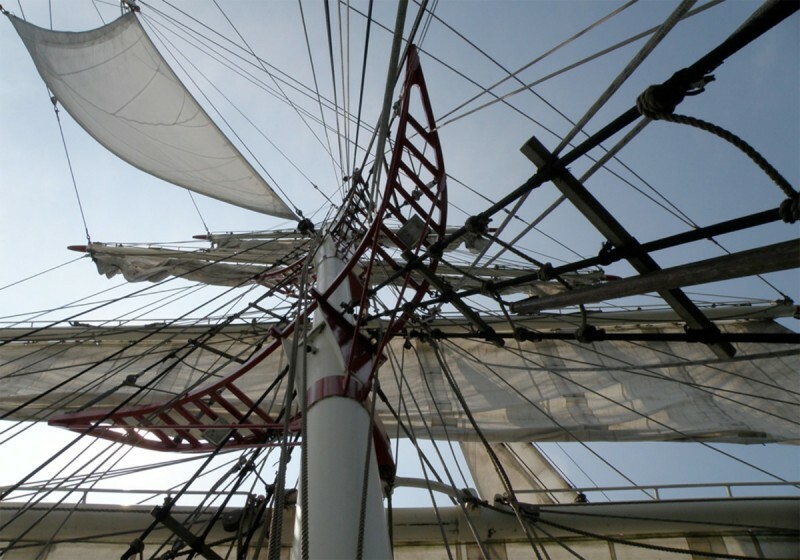 Their admiring looks caressed the sleek hull lines, then climbed aloft along the revolutionary Dyna rig consisting of square sails attached to tripod masts. “Very interesting indeed!” the CEO nodded enthousiastically. Surrounded by his attendants the sultan dashed the champagne bottle to pieces against the towering straight stem. A round of applause, festive arabesques and wild dancing set the scene as the bright blue woodcore hull started sliding slowly down the slipway. The sharp cutwater caused not a single ripple in the river, which even the sultan’s camel couldn’t help but notice. The animal had been accompanying his master during business trips throughout the shipbuilding stages, and would also be on board on the maiden trip. The animal was the first to cross the gangway and was lowered into the hold by a lift. On arrival down below his snout produced an ear-to-ear grin as he found a state-of-the-art stable, furnished up to royal camel standards. The ship cast off and was towed out on a nearby estuary for a test trip. A steady breeze blew impressive cloud masses across the sky as the ship accelerated under only a few sails, to the delight of the sultan’s attendants who burst into a party that lasted way into the night. The shipyard personnel was repeatedly hailed in praise. 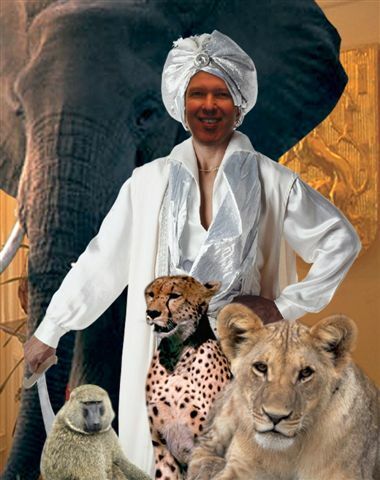 In order to make the maiden trip a commercial success, zoos from all over Holland were requested to supply camel droppings to fill the ship to capacity. Shifts of attendants worked hard tot stow one bale after the other into the lower hold until finally the Plimsoll mark touched the water line. The ship being ready to set sail on her maiden trip, Ron de Vos was the last person to come on board; he was appointed to familiarize the crewmembers with all the technical details of the new vessel. Originally, the idea was to set a course for the Mediterranean and the Suez Canal. However, once at sea under full sail, Khamsin proved to make so much progress that the sultan ordered the ship to follow the ancient clipper way around the Cape of Good Hope with its favourable trade winds. Rolling on the high seas Khamsin made huge 24-hour runs under sail alone, which caused some crewmembers to hang over the side; nevertheless, the camel remained untouched by seasickness. That night, an extra lookout was sent up into the foremast, bringing night binoculars to support the radar. Then came eight bells: the dog watch. The bow wave hushed gently to the swell. In the moonless night the desert perfumes came across the sea driven by the warm wind. Suddenly, the lookout’s voice sounded in the dark like an experienced muezzin. Ron de Vos, who was just about signing off, immediately understood what was going on and what had to be done. Two, three steps at a time he descended into the lower hold, where the camel’s attendants were sound asleep. “Come on, boys! This is it!” he shouted in his best French. “Allah is great!” they replied. There was a tense moment when the pirates started a yell, the words of which nobody understood but the rhythm, intonation and phrasing of which were unmistakable. Their vessel remained invisible behind the bright light, you could tell only from the sound of her engine and the swell crashing against the sides that she tried to come alongside. The two men in the engine room switched on the drain tank pumps at full speed. In the meantime, a row of air conditioning tubes stretching along the full length of the deck opened up. Next moment, a smelly shower of sticky mud was sprayed across the pirate’s deck, instantly transforming it to one big filthy slipway. There was a deafening roar of horror from the villains, and an equally deafening one of surprise from Khamsin‘s crew. The pirate ship’s deck lights were sprung, showing the pirates’ desperate attempts to keep clear of the mess, which of course they didn’t make as they held on to each other just to stay on their feet. None of them was remotely willing to carry on with the attack, which gave Khamsin the opportunity to wear round, set all sail, and disappear soundlessly into the night. 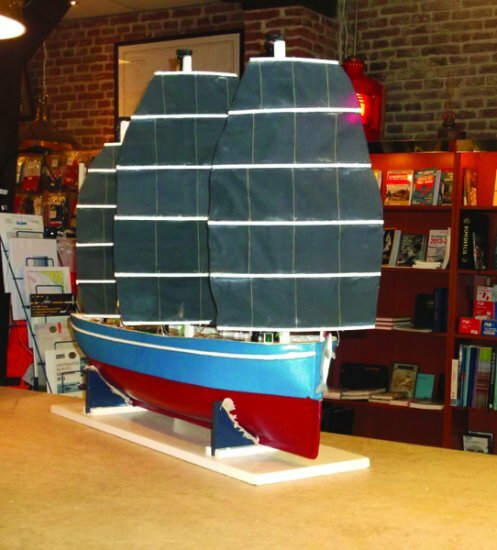 The picture of the Wind ship 1 model was reproduced by kind permission of Ron de Vos. Should you wish to know more about, or contribute to Ron de Vos’s Wind ship project, please check his site or click here. A folder in PDF format is available below.